A group of 12 fourth-year students from the University of New Brunswick’s faculty of forestry and environmental management has created a contingency plan for nine parks and trails in the City of Fredericton should damaging emerald ash borer beetles find their way to the province. The little green bugs have decimated the ash tree population throughout southern Ontario. Though they have not yet been detected in New Brunswick, the bugs have quickly travelled from Ontario to Winnipeg and Quebec City. The group believes it is only a matter of time before the beetles reach the forests of New Brunswick, likely ferried in on firewood. The UNB group is suggesting that the city set sticky pheromone traps and monitor the nine areas as a precaution. If and when the beetles are detected, the group would like to see the city implement its plan, and inject healthy ash trees with a pesticide that would ward off the troublesome bugs. Ms. Demand says the injections will help lower the potential for human injury and damage to public and private property. Though treatment options to ward off the bugs are limited and costly, the team believes that a proactive, rather than reactive, approach will save the city money in the long run. “I don’t think people are aware of the magnitude of what this problem could be,” says Ms. Gascoigne. Between seven and eight per cent of trees in the parks and trails surveyed by the group are ash, and while those numbers aren’t particularly high, Ms. Gascoigne believes that, if infested, the effects will be devastating. 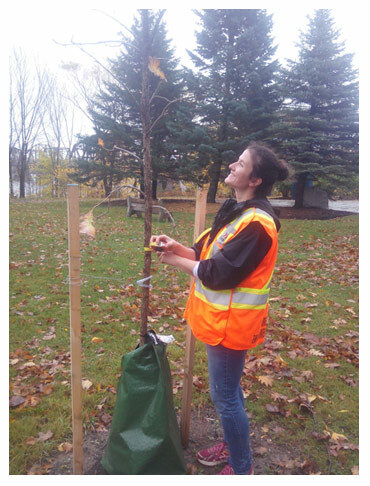 The group’s plan, Two Steps Forward: An Urban Forest Management Plan for Fredericton’s Parks and Trails, was developed for this year’s 4020 Capstone Practicum along with seven other groups. They will present their projects on April 6, 2018 in the Forestry and Geography Building on UNB’s Fredericton campus, second- and third-floor hallways in rooms 203, 305 and 309, beginning at 1:30 p.m. In addition to the management plan, the group has created an inventory of every tree in nine of the city’s parks, noting each tree’s size, species, health, value, and GPS location. The plan also includes a pruning management schedule to help maintain trees in good health. “A maintenance schedule will give the trees a longer, healthier life,” says Ms. Gascoigne. Mr. Golding says that the City of Fredericton has been instrumental in this partnership, helping students to work on real problems faced by graduates.